Q: How can I track my bills in EEBA? Between utility bills, insurance premiums, service charges, loan payments, and who knows what else, keeping track of “the bills” can be a headache. Create an expense to keep track of each of your bills. For bills that vary in amount you can enter an estimate for now. Set the expense to repeat whenever the bill comes due. Finally, check the box to “Remind me by e-mail” so EEBA will remind you before the bill comes due. When EEBA reminds you to pay your bill, do so! You can then wait for EEBA to post the expense automatically, or head back to the Scheduled Expense page and click on “Edit” for the bill you want to pay. 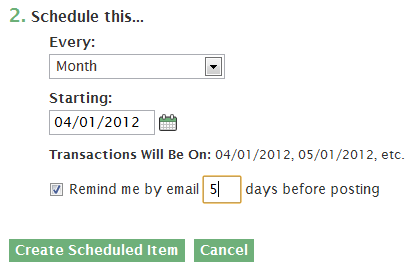 There you can adjust the amount as necessary, then click on “Record Now” to post the payment on that day. That’s it. By using the Scheduled Expense feature in EEBA, you can set reminders to let you know when each bill comes due so you can be sure to pay them. Yes, I love this feature, however I run into problems when EEBA automatically posts the expense when I have not actually paid it yet. This is great for ACH expenses that are indeed automatically paid, but not for the those expenses that I have to manually pay. PLEASE, PLEASE, I would LOVE it if I can choose which scheduled expenses need to post automatically and which ones I have to choose to record manually as I pay the bill. @ H Cambern, that makes sense that you’d want to choose when to have EEBA post recurring expenses automatically and when to record recurring expenses manually. I’ve added your thoughts to our feature request tracker. Hi Ramona, at the moment the best solution is to use the email as a reminder to either post the expense, showing that you’ve paid it, or to edit the date so that it does not post, showing that you have not paid it yet. I’ve added your comments for better bill management into our tracker, thanks for the feedback! The solution I came up with is creating a dummy envelope (called “Bill reminder”) and set a zero budget amount for this envelope. Then I set all my bill reminders for their monthly date, but I set the amount to zero, and I tell them to come out of the bill reminder envelope. This way I’m getting a reminder when every bill is due, but the system isn’t automatically posting it for me.